The Landmark is the oldest standing residence in the City of Bromley, and one of the oldest dwellings in Kenton County. The builder of the home was Prettyman Merry. Merry received a land grant of 2000 acres from the State of Virginia in 1784. This grant included most of the modern day town of Bromley. Merry was married to Katherine Suggett in 1769 and the couple had ten children. Merry and his family began constructing the Landmark soon after they received the land grant in 1784. 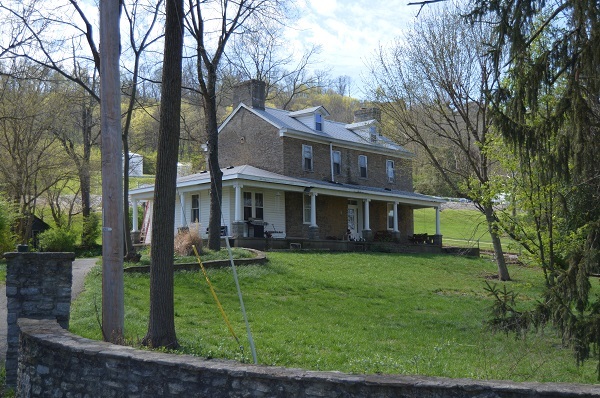 The original home was constructed of native fieldstone and contained four rooms (two up and two down). The home was heated by five fireplaces – one in each room, and one in the basement for cooking purposes. In 1815, John Merry purchased the Landmark and 300 surrounding acres from the Merry family. Merry only lived in the home for a few years. In 1818, the Landmark was sold to William and Nancy Moore. William lived in the home until his death in 1825. In 1848, Charles Collins and his wife Lucinda Moore Collins acquired a large portion of the surrounding acreage (Lucinda was the daughter of William and Nancy Moore). In that same year, Charles Collins laid out the first city streets and began selling small lots. Collins was a native of Bromley, England, and therefore chose the same name for his new town in Kentucky. Dr. Israel Evans purchased the Landmark and the remaining 27 acres in 1848. Evans lived in the home a practiced medicine in nearby Ludlow, Kentucky. The next owner of the home was the Rothard family. It was during this era that the original appearance of the structure was dramatically changed with the addition of a large front porch, a smaller side porch, and the addition of a den and kitchen. The small four-room home had become a six-room dwelling. In 1915, Harry and Maud Traylor acquired the Landmark from the Rothards. The Traylor’s spent two years restoring the home before moving in. By this time, the land surrounding the home had shrunk to 5 ½ acres. The Traylor’s were responsible for the installation of a large wrought iron fountain on the front lawn. This fountain originally graced the grounds of the Ludlow Lagoon Amusement Park. When the park closed in c. 1920, the Traylor’s purchased it for their property. At the time of the Traylor occupancy, the property included the main house and four small cottages. During the 1937 Flood, the Landmark sat on high ground. The Traylor’s extended their hospitality to 13 Bromley families who had been driven from their homes by high water. The Traylor’s daughter, Dorothy Traylor Jennings and her husband Gordon Jennings inherited the landmark. Dorothy planted thousands of shrubs and flowering plants of the grounds. The Jennings were very active in Kentucky politics. They entertained frequently in the old home. Kentucky Governor A.B. “Happy” Chandler and United States Vice President Alben Barkley were among the honored guests. The Jennings sold the home in 1964. Today, the Landmark continues to serve as a family home. Poweleit, Alvin C. M.D., Bicentennial of Physicians in Northern Kentucky: Past and Present, p. 62; MS: “Landmark,” by Patricia Shadwick Stewart, 1974.